As those who joined The Legal Genealogist and Legacy Family Tree Webinars yesterday for “Martha Benschura: Enemy Alien” know now, when the United States entered World War I, a new rule was imposed on citizens of countries with which it was at war. Every genealogist’s dream record, isn’t it? The hitch, of course, is that not all of these records survive — most don’t — and there isn’t any one central repository. You can’t just contact the National Archives and ask for Great Grandma’s alien registration form. Oh, some are in the National Archives, for sure — affidavits from Kansas and Arizona are NARA Record Group 118, Records of U.S. Attorneys and Marshals, along with a few from North Carolina and Louisiana. The Kansas affidavits have been digitized and are available on Ancestry.com and Archives.gov. But most of these records were locally held and, if they survive at all, they’re still at the local level. Registration forms for San Francisco, for example, are held by the San Francisco Public Library (and, fortunately, have been digitized by FamilySearch.org). Minnesota records are on microfilm at the Minnesota Historical Society in St. Paul and at the Iron Range Research Center in Chisholm, Minnesota. But there are bound to be others — not so well known, not so easy to find. Everyone who works with these records knows that the big problem for these World War I era records is finding the ones that do survive. And almost as soon as the webinar ended, my email program pinged and in came a very welcome bit of information from reader Renee Carl of Washington, D.C., who noted that the Fort Wayne-Allen County (Indiana) Historical Society has some of these records from Fort Wayne, Indiana — and there’s a finding aid online at the Allen County Public Library’s Genealogy Center website here: Genealogical Records of German Families of Allen County, Indiana, 1918. 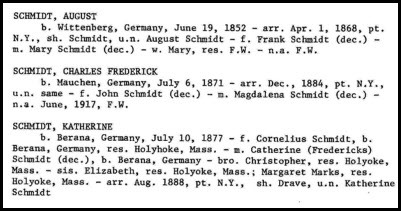 So at the Genealogy Center website, you can — for example — search for names that include “Schmidt” and get 11 hits for people whose names are, or include, Schmidt (from Messerschmidt to Waldschmidt and everything in between). Click on one of the links, and it takes you to the page of the original transcript where the information appears. An explanation of the abbreviations used appears at the top of each page. And, of course, as good genealogists, we don’t want to use derivative sources when the originals are out there, so… looks like some folks with Indiana ancestors are going to need to join the Allen County-Fort Wayne Historical Society: $35 a year for individuals, $30 for seniors. A single visit to its History Center to check out your family’s records will cost you $6 if you’re under 65 and $4 if you’re over. I have been transcribing naturalization records for the Washington State Digital archives and a bunch of them have had notes saying copy made and dated 1917, so I guess a few of the naturalized citizens needed to prove they were naturalized because of that law. Thanks for the AHH moment. Yeah, a war would tend to make a lot of people want to prove their status, for sure. Thanks for the shout out, Judy! I learned a lot from your webinar, and am bound and determined to find more of the WWI Alien Registration Affidavits. Thank YOU for the lead to the Indiana documents!